This map shows the national reach of El Editor. 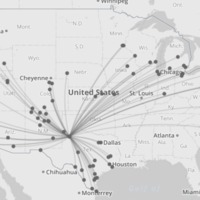 This map shows the regional reach of El Editor. 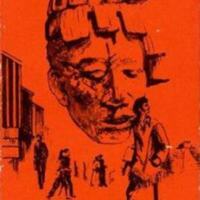 Book Cover of Chicanos: Our Background and Our Pride (Lubbock: TX: Trucha Publications, 1972) by Nephtalí De León. 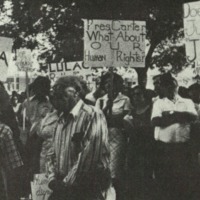 The San Angelo League of United Latin American Citizens (LULAC) rallied in front of the Tom Green County Courthouse to protest a wave of police shootings of ethnic Mexican men and boys across the state and nation during the 1970s. 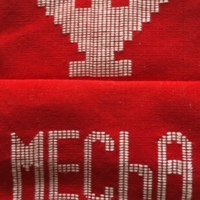 A Movimiento Estudiantil Chicano de Aztlán (MEChA) logo. 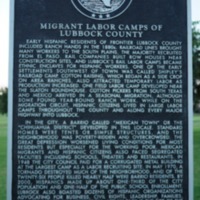 This Texas Historical Commission marker notes the migrant labor camp that existed where Aztlán Park is now from World War I to the 1960s. 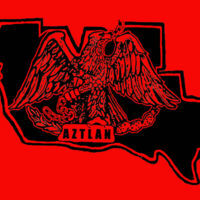 Aztlán Flag that La Raza Unida (People's Party), the offspring of Mexican American Youth Organization, adopted. 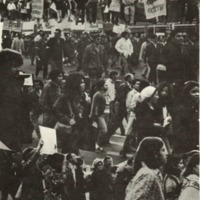 March of Faith in Lubbock, Texas on November 7, 1971. 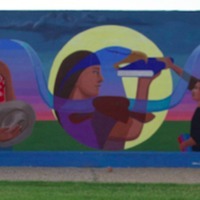 Image copied from Nephtalí De León, Chicanos: Our Background and Our Pride (Lubbock, TX: Trucha Publications, 1972). 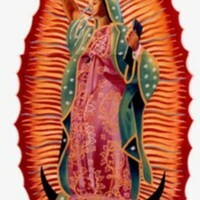 La Virgen de Guadaliberty painting by Nephtalí de León. This painting has been featured across the nation during social justice protests and meetings.